Don't Miss Your Michigan Continuing Competency Requirements Deadline! Residential Builders in the state of Michigan are required to complete a required amount of continued education before their May 31st deadline every three years. If contractors have been licensed for less than 6 years, they are required to complete 21 hours of approved continuing education for each of the first two 3-year licensing cycles. If contractors have had their license more than six years, they are only required to complete a 3-hour Code/Law/Safety course to renew. We have a brand new 21-hour package with fresh new content that meets all State of Michigan requirements. Topics in this course include project management, planning and project startup tasks, controlling finances, managing project progress, environmental, energy, and safety issues, and successfully closing the project. The goal is for you to have the skills and knowledge to manage your projects and maximize profits. This course is an introduction to the construction estimating process. It covers the bidding and estimating process, contracts, and structuring bids. It also familiarizes you with blueprints and architectural renderings to help you successfully bid on a project while reducing hidden costs and maximizing profits. Drones are a hot new tool that can help you in many ways. This course explores the benefits of drones in the construction industry as well as guides you through regulations and best practices. This three-hour course is a review of the most recent code, law and safety changes in the Michigan construction industry. The first hour focuses on the 2015 Michigan Residential Code book and the latest changes. Next, the fundamental principles of contract law and the elements of a construction contract are explained. Finally, the last hour reviews OSHA regulations and the safety codes required for residential construction. This course satisfies the State of Michigan renewal requirement for residential builders and maintenance and alteration contractors. Priced at only $160, this package has everything you need! 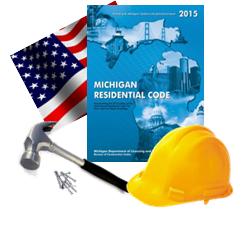 We also have a bundled package that includes the 2015 Michigan Residential Codebook at a discounted price of $260. The code book is regularly $145 so you save $25. Get started today and beat the deadline! Sign up here. This entry was posted in Construction and tagged michigan builders license.